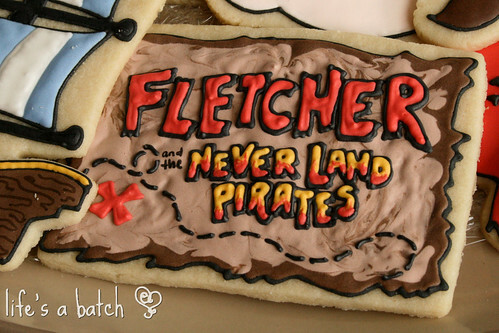 It’s time for Fletcher’s 4th birthday, and he chose to celebrate it this year with Jake & the Never Land Pirates! Fletcher’s mommy has been a sweet friend of mine for several years now, and she has set a precedent in challenging me for his birthday cookies. 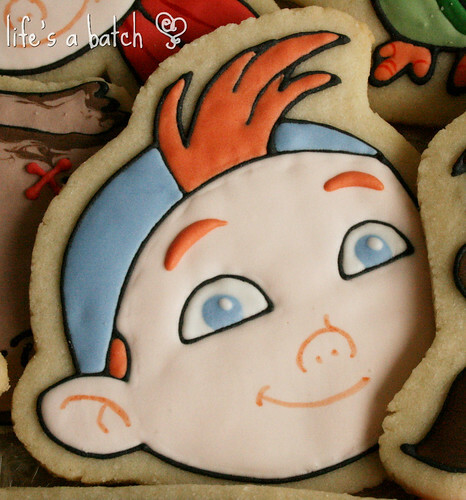 Last year, I made him these Peanuts cookies for his 3rd birthday, and whew! They were so difficult for me at the time! 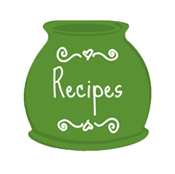 Now, however, I made Peanuts so many times I’ve lost count, and they’re easy-breezy. In fact, I just did two more sets of Peanuts cookies this week! 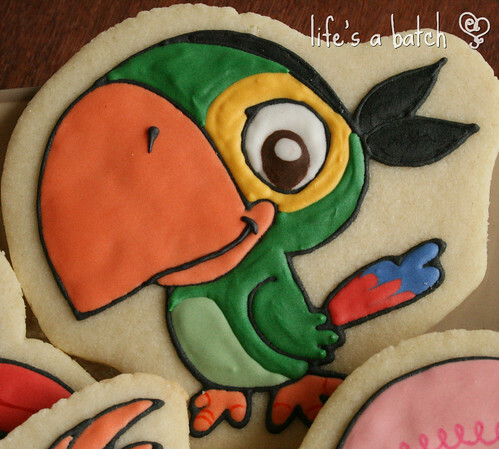 Just like last year, Fletcher needed a personalized logo cookie. I really had to smush the letters to make room for “Fletcher.” After all, it’s twice as long as “Jake” in the original show’s logo! And then his mommy had given me a list of characters that Fletcher liked best. 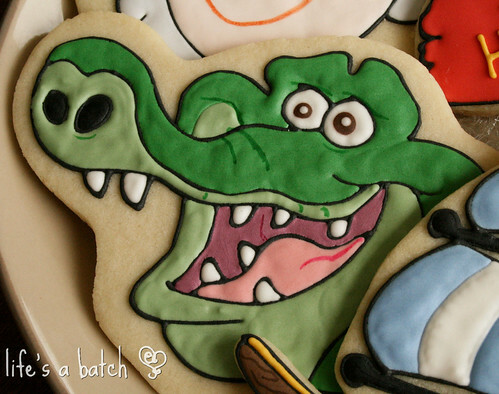 I did some researching on my own, and I absolutely *had* to add the lovable Tick-Tock Croc to the mix! Isn’t he fun? In my opinion, the set just wouldn’t be the same without him! Here’s a few close-ups of the other characters, too. 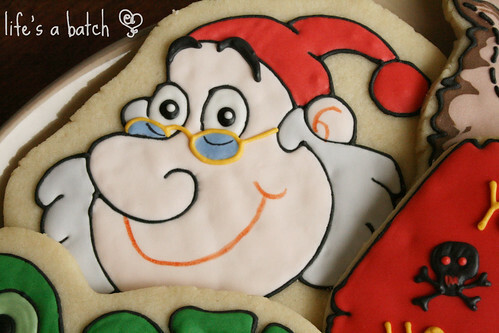 Icing Smee’s glasses was a multi-step process, by the way. First, I piped all the outlines in black, including the eye “holes,” but I didn’t pipe a full oval, and instead, left it open-ended at the bottom. 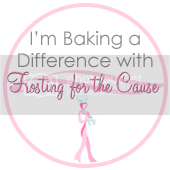 Second, I flooded in the whites of his eyes, leaving them a bit less than oval to make room for the peach icing to follow. Third, I flooded with the peach icing of his face. Fourth, I flooded his hair and the tuft near his ear with the pale gray icing. Once all those steps were set for a bit, I used golden yellow icing to pipe his glasses, making sure to pipe large enough ovals to touch the original black piping icing where it left off, for a seamless look. 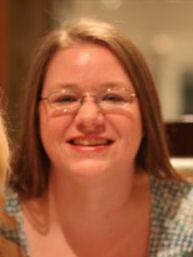 Then, I filled in the glasses with a pale blue flood, and I left it to dry overnight. Lastly, I drew on the thinnest lines to complete his eye “holes” inside the blue lens of his glasses with a fine tip black edible food marker. Ta-da! 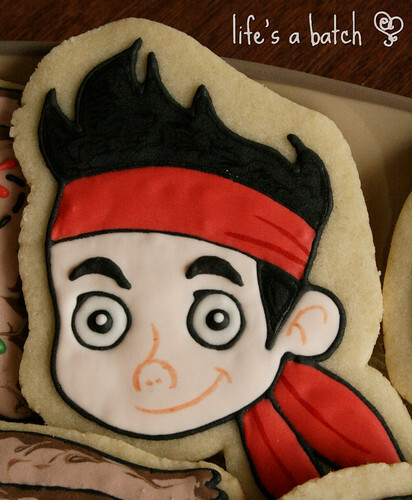 Besides the characters, I made a few “filler” cookies as well. 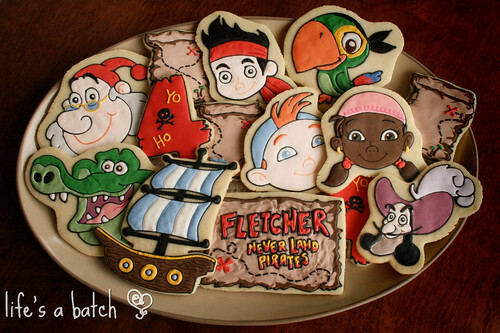 Fletcher’s mama had requested treasure maps and #4 cookies, and I made several of each. 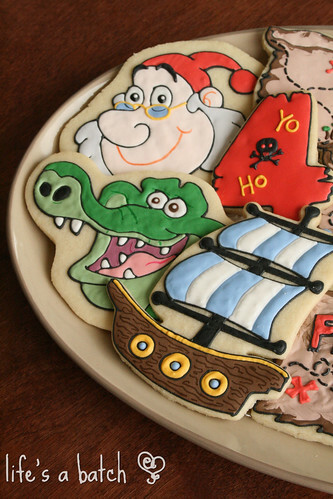 In fact, instead of going with my usual striped number cookie, I borrowed a design from the talented Krista, of Cookies With Character, to make the pirate-y #4′s instead. I also threw in a couple large ships. After all, Jake needs a ship to be a pirate, right?! And now, Mateys, it’s time to walk the plank! « Hippity-Hoppity, Easter’s on it’s way! I wouldn’t even attempt these! They’re PERFECT!!! Oh my gracious they’re beautiful. I would absolutely cringe looking at the kids grabbing those cookies if they hadn’t each at least admired them for an hour before chomping into them. There must be some contest you could enter them in – they’re so detailed & life like. Hats off to you! You made the pirateing community proud. Thank you, Tavette! 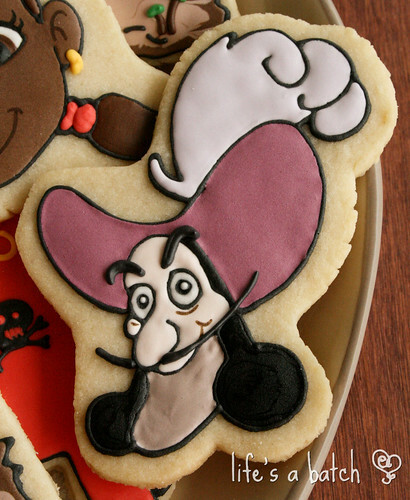 You are too sweet – cookies are ALWAYS for eating, no matter what they look like! These are over the top wonderful! Fletcher must have been the happiest birthday boy ever. These are great. 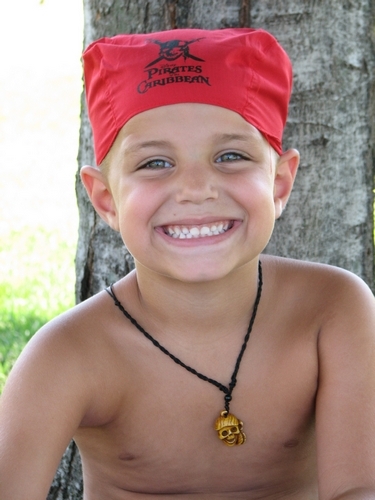 my LO is a pirate fanatic! I live in Maryland and wanted to know could I get some of these by April? Where did you get the cutters from? 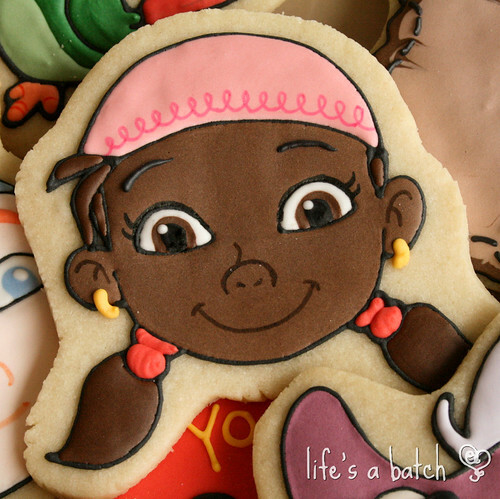 This cookies are amazing! Jaclyn, I had to hand-cut all of these, with exception to the map (scroll cutter), the logo (rectangle), and the ship. These are perfect!!! Do you take any orders?? ?